South Africa joins the comity of nations in celebrating the International Mother’s Day on the ensuing 11th May. A Happy Mother’s day to everyone! Last Tuesday at our Glen Anil Main centre we handed over gift packets to a group of mothers from Greenbury Project. It is not without any reason that our sages in the past had described this ‘samsaara‘ – the cycle of birth and death – as immensely vast as (bhava saagaram) the ocean. They have even detailed in the most frightful terms how difficult it is to cross over this ocean. When you are almost on the verge of losing hope some other saint compares this samsaara with a mere river. But not an ordinary river, forsooth. He calls it ‘rana-nadi‘ – a ‘battle-river’ – whose waters are infested with terrible crocodiles and alligators all living in its forceful current that produces strong whirlpools! And lo! just imagine how dangerous it would be to attempt to cross such a river not to speak of the ocean! How many of us have in real life have even thought of attempting to cross such river or ocean? 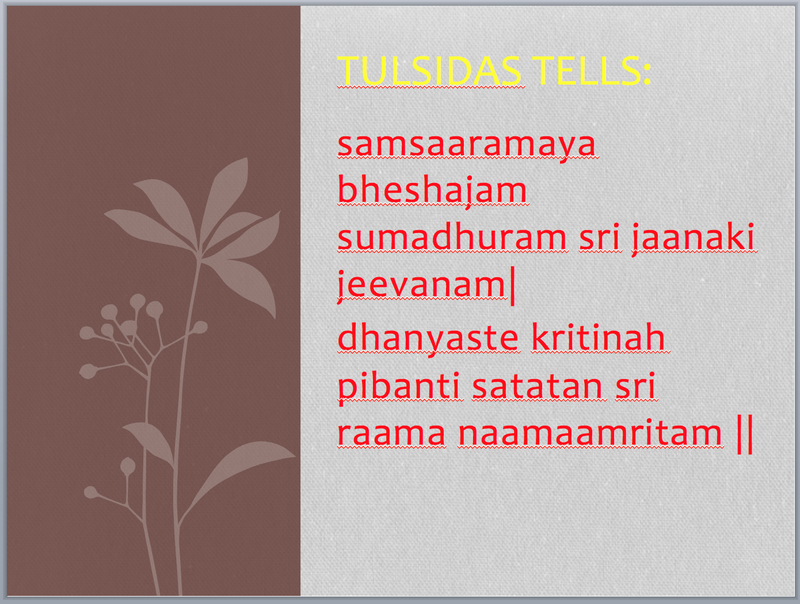 Tulsidas, of course in his saintly way makes samsaara a little less fearful. He calls it a disease. If that can be wisely diagnosed, it can be well treated too. This brings us some kind of relief in knowing that my disease is curable and the condition is that I should take proper medicine. Does taking medicines indeed bring about the cure of the disease? Not necessarily! We have experienced in our lives that many a time the medicines not only fail to have any curative effect but to our chagrin add some disturbing side-effects. If samsaara is a disease, then is there any medicine? Yes, there is, declares Tulsidas. While expressing the greatness of the life of Mother Sita he considers her life story as nothing but a ‘medicine’ for the ‘worldly disease’. No one likes to take medicines as the chemical compositions generally make them bitter in taste. But this medicine, he adds, is exceedingly sweet. Normally after taking medicine one requires plain water to clear the throat. Here of course the very nectar is itself given! So Tulsidas opines that those that drink nectar of Sri Rama’s name, are indeed ever blessed! Yes, the story of Sita is a miracle medicine. The holy book Ramayana is divided into seven kaandams. The fifth division called Sundarakaandam has gained much popularity among the devout Ramabhaktas. I do remember once when I was young, my mother was advised to recite Sundarakaandam verses with love for 41 days to ward off certain evil effects in the family. She gained such an unshakeable conviction about the marvel of this scripture that all problems got resolved within that period of paaraayanam. What does Sundarakaandam teach? It speaks about in large measure the valour of Sri Hanumanji who undertook the work of Sri Rama in searching for and finding Mother Sita. Scholars of Ramayana say confidently that Sundarakaandam is all about Sri Hanumanji. Though I am not a scholar in Ramayana, purely from the point of view of a devotional angle I offer my two cents: I prefer to look at this way viz., that Sundarakaandam is all about Mother Sita. – Her dealing with King Ravana was indeed so majestic; in spite of his great offering of material temptations, she nonchalantly turned down his advances. – Her interaction with her demoness guards especially with Trijata has no comparison; the care and concern for Trijata‘s welfare even though she had been appointed to spy over her, singularly exhibiting her divine compassion. – Her polite refusal to Sri Hanumanji’s proposal to carry her away stealthily from Lanka and proudly speaking about her husband Sri Rama’s necessity to win the battle with Ravana and then only she would be ready to return with him in all glory. 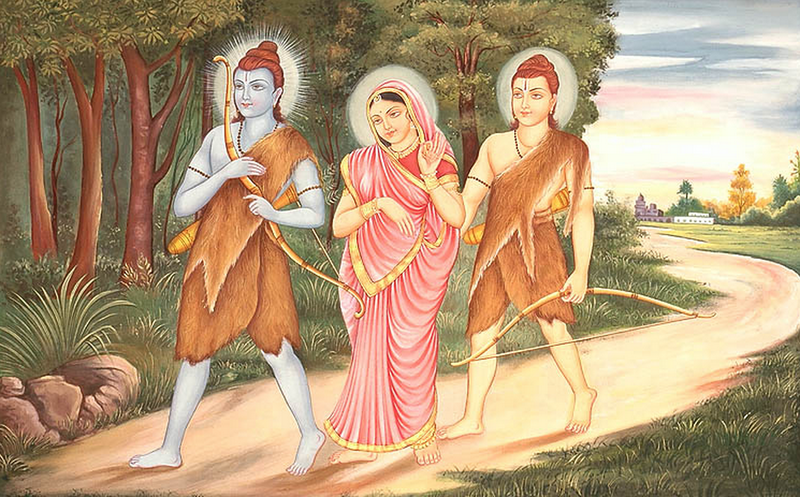 In this Sundarakaandam Sita is not a mere loyal wife only to toe the line of her husband; she comes out in her own right (and in the absence of the physical presence of Sri Rama) that amazes me as I see her personality looming large into a bright towering one that demands not only an adorable worship with love but also absolute surrender at her feet. Thus, devotion to one form of Mother, if cultivated from a young age does not preclude love for other forms of Mother. Rather it definitely helps in transposing one’s devotion easily on another form of Mother, if needed! The variety of names and forms of Mother in Hinduism may bewilder anyone who is not acquainted with the philosophy of Vedanta. But a devotee in this tradition accepts the Divine Mother as ‘ananta roopini, ananta gunavati, ananta naamni girije maa’ – O Girije Ma! thou art infinite forms, infinite qualities and infinite names, says a poet-devotee. Hence the transition from Sita to Sarada was smooth enough in my life. Ma Sarada’s experience in the Rameshwaram temple vouchsafes that she is no different from Ma Sita. When Holy Mother visited Rameshwaram temple, Tamil Nadu in 1910, she was directly taken to the sanctum sanctorum and was allowed to worship Lord Shiva in the form of uncovered Shivalingam. The Mother offered 108 golden leaves shaped like the real leaves of the bel (vilva) tree. She stayed in that small town for three days and every morning and evening she would visit the temple and perform worship with flowers, chandan (sandal) and vilva leaves. The Holy Mother observed all customary traditions of the temple. O Mind! Drink the honey that flows from the lotus feet of the Mother…best remedy for worldly disease! Swami Gambhiranandaji in his authoritative biography – ‘Holy Mother Sri Sarada Devi‘ – explains thus. “The devotees believe that the same personage who incarnated in the Treta yuga as Sita, the ever faithful consort of Ramachandra, descended again as the all-enduring and ever gracious Holy Mother, so that the sudden sight of the uncovered image carried her mind unconsciously across the vast span of thousands of years and the past appeared as a vivid present; and forgetful of her immediate environment she made that spontaneous remark.” Swami Abhedananda, one of the Direct Disciples of Sri Ramakrishna, in resemblance to the ‘worldly-disease’ mentioned in the beginning of this post, follows the footsteps of Saint Tulsidas. What is the remedy? 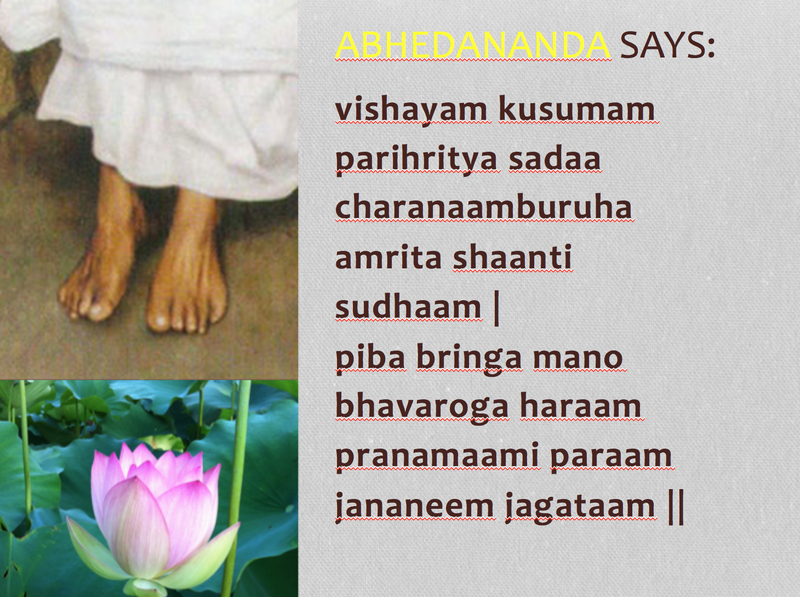 Abhedanandaji goes on to say that the remedy for this ‘bhava-roga‘ – worldly disease – is to sip the honey flowing from the lotus of the Mother’s feet. On this Mother’s Day, let us take a vow to surrender at Her holy feet! May Mother Sarada who is no other than Mother Sita fill our hearts with her sterling qualities! Many thanks for your excellent blog ‘Sita, the sacred Mother‘. After listening to some hymns & Bhajans (including ‘Ananta Rupini‘) on Mother, I opened my mailbox to be treated with your article on Mother. It filled me with great joy. Regarding Ramayana, I have read only Rajaji‘s ‘Chakravartith thirumagan‘ and later Swamiji’s immortal lecture on Ramayana. Mother Sita‘s greatness is revealed fully in Sundarakaanda. Her fiery responses to Ravana’s words, thus demonstrating that she is not meek and the dialogue between Her and Hanumanji are scenes for meditation. Later on when Sri Rama asks Her to undergo the ‘fire test’, she does so without any murmur. Her famous utterance as written by Rajaji – Kutram cheiyaathavar ever ular? – is really poignant. Rajaji didn’t have the heart to write further on Uttarakaanda for he was not in a position to bear Sita‘s exile. I am always fond of reading Swamiji’s utterances on Mother Sita. If I am correct the first deity who merged into Sri Thakur was Sita. 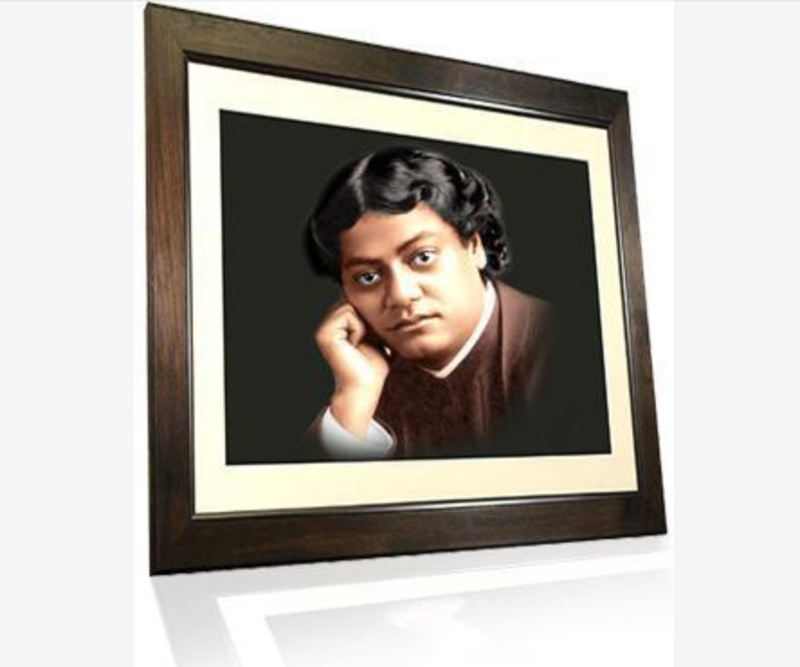 It seems that she bequeathed Her divine and exquisite smile to Sri Thakur. I am also very fond of listening to Revered Premesh Maharaj‘s wonderful song, ‘Dharanir Bhara…. Nihila Matri Hridaya Sagar Manthana Sudha Muruthi‘ on Mother. Revered Swami Sarvaganandaji has melodiously rendered it. Many thanks for reproducing photos on Rameshwaram from Revered Swami Atmasraddhanandaji‘s Vedanta Kesari article. His coverage on pilgrimage to Rameshwaram was stupendous. Heart filled with utmost joy by reading your beautiful words about Mother. Jai Divya Janani Sarada Mata! Just reading your post now and am truly intrigued by mother Sita‘s shakti in galvanising the qualities of womanhood. At first many cast her off as a supporting actress in this drama of Rama. It is however on deeper introspection that one appreciates her role in defining the character that unleashes or unveils the shakti in woman. What a fantastic piece of prose! Such explanations and deliberations makes our faith strong and also humbles us. I never thought about Ma Sita the way you have explained. Gracias Swamiji! Maravillosa enseñanza. Leí con todo cariño y me emociona. Siempre necesitamos una madre, su cariño y su protección. Hoy adoré sus pies para mi y por mi hija. Gracias. Que la Madre este siempre con Ud. Bendiciones. Thanks Swamiji! Wonderful teaching. I read with affection and excites me. We always need a mother, your love and protection. Today I worshiped her feet for me and my daughter. Thank you. May Mother Blessings always be with you. What a wonderful article! it is more sweet this time perhaps because it is about Mother. Swami Tapasyanandaji further extolled the greatness of Ramayana and told that so long as rivers flow and mountains stand, Ramayana will be a live text recited and revered by many all over the world. All the success in his life, Mr Reghunandan says is because of this blessing. He also shares with the readers a hilarious incident in the Ramayana, the moral of which is how people should not behave on sensing seemingly small success, when Hanuman started kissing his own tail and jumping around from one pillar to another when he saw Mandodari and misunderstood her to be Mother Sita. This and the description of Rakshasis in Ashokavana made Tapasyanandaji laugh. We learn a lot of things from the simple things in the life of great people. Let me reveal a dream that I had several years ago in Chicago. I will never forget it. Inspired by the book ETERNAL COMPANION written by Swami Prabhavananda about Swami Brahmananda, I had started doing meditation. One late night after meditation, I slept and had a dream. It was the ceremony of Simant of Sita Mataji – She was pregnant. She was sitting on a high chair and was surrounded by her sakhis. She stood up from the chair and started walking slowly – and She was converted into the Holy Mother Sri Saradadevi wearing white sari. Yes, Mother Sita IS Sri Saradama. Thank you for your personal anecdote. This has only confirmed what numerous devotees have experienced in their lives. Sri Ramakrishna has alluded to her being Sita. She herself had quietly declared it. Your view is deeply appreciated. May Holy Mother Sarada Devi take you to further higher realms of spirituality is my prayer on the Appearance Day of Ma Sita, today being Sita-navami !